There is NO cell service in this area, so don’t expect to be able to call us (or use your smartphone) as you get closer to us. No matter how you plan to find us, print out and bring the written directions with you as a back-up. You’ll thank us later! Take Exit 296 near Strasburg, the second exit south of the I-66/I-81 interchange, for Rt. 55 West. Take Rt. 55 West into West Virginia through the towns of Wardensville, Moorefield and Petersburg (follow signs to stay on Rt. 55 West) to Seneca Rocks. At Seneca, bear left at the three-way stop onto Rt.33 East. Drive about 11 miles, cross the river at Judy Gap and at the end of the bridge turn right onto Rt.28 South. Drive about 1/2 mile and turn left at the NROCKS sign and Yellow House Inn, onto Nelson Gap Road (gravel road). The NROCKS Welcome Center parking area is just ahead on the left. Time from I-81 about 2 hours. Take exit 247B at Harrisonburg for Route 33 West. Follow 33 West through Harrisonburg and into West Virginia passing through the towns of Brandywine and Franklin, WV (follow signs to stay on 33). Approximately 14 miles past Franklin, you will pass through Judy Gap and then take a left onto Rt. 28 South toward Circleville. The NROCKS Welcome Center parking area is just ahead on the left. Time from I-81 about 1 hour 30 mins. Take Interstate 79 to Weston, WV. In Weston, take exit 99 for US Route 33 East. Take Rt. 33 East through Buckhannon to Elkins. 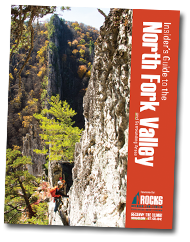 At Elkins, follow signs to stay on 33 East and onto Rt 33/55 to Seneca Rocks. At Seneca, bear right at the three-way stop to continue on Rt.33 East. The NROCKS Welcome Center parking area is just ahead on the left. Time from Weston about 1.5 hours. Take WV Rt. 32 South to Harman, WV. At the stop sign, proceed onto Rt. 33/55 East for approximately 12 miles to Seneca Rocks. The NROCKS Welcome Center parking area is just ahead on the left. Time from Canaan Valley about 50 mins.